I am a first generation Polish American. My parents came from Poland in the early 60s, and my childhood was much like the family depicted in My Big Fat Greek Wedding, only instead with Poles. My parents spoke Polish at home, though because I am the youngest I was exposed more to Polglish than Polish. I grew up thinking that “carro” was the word for “car” in Polish. Nope, Polglish. See, to invent Polglish words you take the English word roll the “r”, if applicable, add an “o” at the end and voila! Polglish. The actual word for car, I learned much to my embarrassment when I was 16 and visiting Poland for the first time, is pronounced SAH-ma-hut. Nothing like carro. Thanks, Mom and Dad. We went to church every Sunday to a mass that was entirely in Polish. Of course as a child I easily tuned out the Polish sermons. I knew by the cadence of the words and hymns when to stand sit and kneel. But the words were entirely lost on me because at 7 AM on Sunday morning I wasn’t awake enough to tune my brain into it and absorb the Polish I’ve grown up hearing. And thus I lost any connection to organized religion still to this day. My dad still sings in that choir every Sunday, though. After church we went to an aunt and uncles house, on my Mom’s side. We took turns hosting breakfast with aunts and uncles. My parents hung out with their siblings every week on Sundays. They were best friends. They all arrived here and tried to navigate what it was to live in America and raise a family here. They were all they had and they stuck together and got through trying to be American side by side. So every week I saw my cousins, and they were truly my first friends. Much like the family in My Big Fat Greek Wedding, my parents also had their own business—a machine shop that still employs the same people I’ve known my entire life. My uncles (my Mom’s brother and brother in law) also started a similar shop, just like the aunts and uncles in Greek Wedding. Oh and get this, I once saw my Uncle Eddie clean a wound with Windex—just like the Dad in the movie. Food was a big tradition in our family. Pierogi (which are kind of like Polish ravioli), golumpki (stuffed cabbage), kapusta (stewed shredded cabbage with pork and vegetables), and this chicken dish my Mom used to make. It had a bread called chasta, and on top of it was chicken and onions. The way she cooked it was like an upside down cake. She put the chicken in the bottom of the pot with the onions, then put the dough on top of it and baked it. Then she’d invert the whole thing so the chicken was on top of the bread. She used to make crepes and shred apples, we’d roll up the apples in the crepes and there was dinner on Friday night during Lent (because she hated cooking fish, but did it sometimes because my Dad loves seafood). The crepes, called nalesniki, were a favorite. Another favorite was when we had leftover mashed potatoes and she’d make the equivalent of gnocchi and pan fry them with butter. But pierogi are a thing in Polish cuisine. But because making them is so labor intensive Mom would make them for special occasions. In the summer she’d keep me occupied with the promise of blueberry pierogi for dinner. She’d send me to our bushes and told me to pick. Normally I’d come back with blue lips and a fistful of berries. But she promised. So she picked the rest and made me my favorite. We’d drizzle sour cream and sugar on them. Every so often I eat pierogi. Never pierogies, mind you. In Polish pierogi is already plural with the “I” at the end. I will never bring home those crappy Mrs. T’s Pierogies (it literally says “pierogies” on the box! Sign #1 that they aren’t even remotely legit). I’ll get some from a Polish deli, and I’ll get the candy my Mom used to bring home too. I bite into them, and tears form in my eyes at aching for that moment to learn to make them. I tried to learn once, I think I was in college. Her recipe was “Add flour until it looks right.” And what in the hell does that mean? She took over making the dough and the filling. She taught me how to bind the edges and twist a scalloped edge along the edge to make it look pretty and close the edge. When she tried to teach me how to do the twisty edge thing, she held up her fingers and made that “tiny violin playing just for you” motion and said “Like this.” Yeah, OK, that makes sense, Mom. 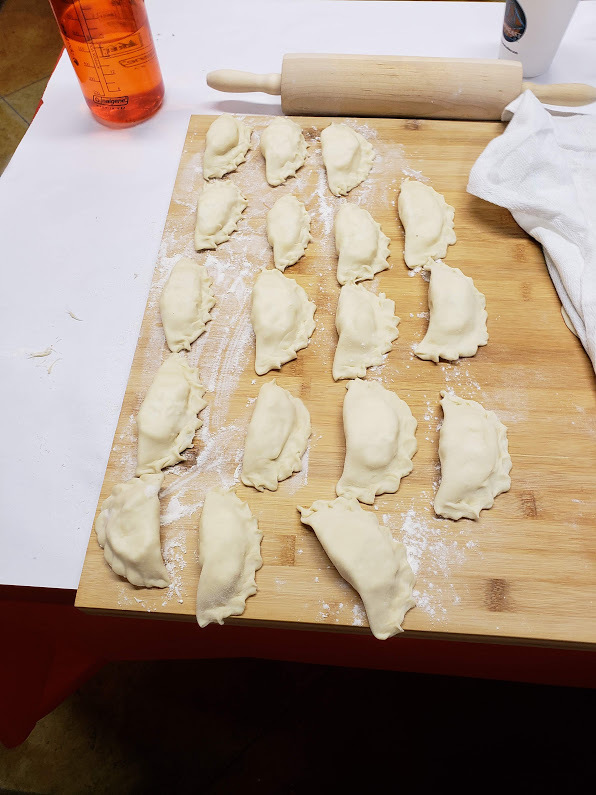 A Polish deli here in Rhode Island posted on Facebook that they were holding a pierogi cooking class. I jumped at the chance. I signed up immediately. I just went on Wednesday night. 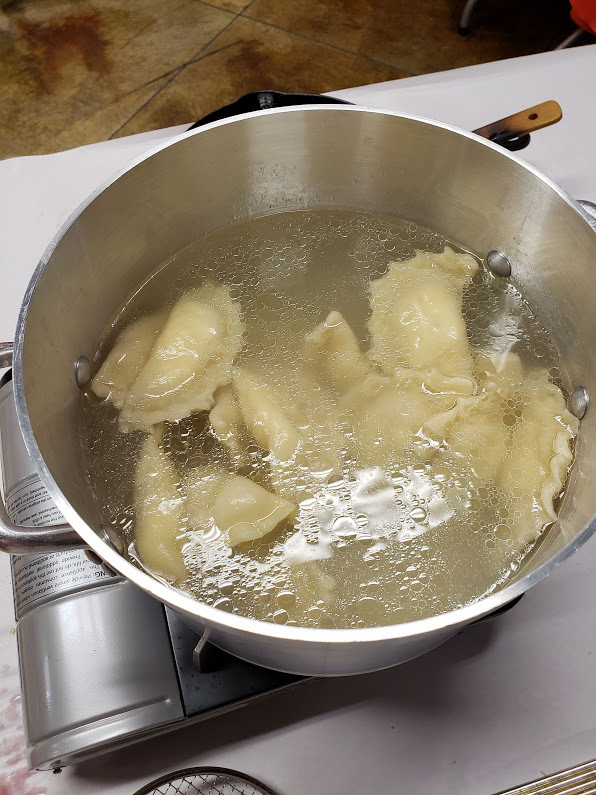 They’re going to send me the recipe for the dough, so that I have something more concrete than “Add flour until it looks right.” We made potato and cheese pierogi that night. These are called Russian pierogi and contain a farmer’s cheese that is kind of like a dry ricotta, mashed potato, and onion and bacon. They sautéed the onion and bacon together. In my family my hatred of the onion is the stuff of legends. I declined the onion because I am a grownup and I don’t have to cook with them if I don’t want to, dammit. I added the oil to the flour, and the water. I kneaded. My mind went back to my Mom kneading. My mind went back to her tearing off a piece of dough for me to play with. I remember me and my cousin Joanna pressing our dough onto various things around the house to make shapes in the dough. The underside of the rug made a basketweave pattern that I thought was cool. I kneaded and she was with me. I rolled the dough into the small circles, about the size of a coaster. I mixed the potato and cheese together and scooped them into the filling. I folded my dough circle in half and willed my hands to make the tiny violin motion. I wanted to twist them just like she did. I slid my thumb against the side of my index finger and made my way around the edge of my pierog. (Pierog is singular for pierogi.) And the twists formed. Not as perfect as hers. But they were there. The owners of the deli brought out a few other dishes for us to try as we made our pierogi. And it was like years of childhood dinners in one night. Then they told us about lazy pierogi. Turns out the gnocchi my mom used to make is what they called lazy pierogi. It’s basically the cheese and potato filling mixed with an egg and flour. And then they panfried it in butter. They brought those around—one of my absolute favorites that Mom made. I bit in and tears filled my eyes again. I hadn’t had the lazy pierogi since I was a kid. I closed my eyes and paid close attention to the flavor. I chewed slowly almost hating to swallow. I brought home 18 pierogi. The next night Todd and I panfried them in butter, which is really the single best way to eat pierogi. The butter makes the dough crispy. And you can’t go wrong with putting butter on something anyway. So I learned. And I will make blueberry pierogi next summer. I will make apple ones. I will make potato cheese ones for Todd as those are his favorite. I am now a complete Polish woman. This is what the pierogi look like before they get cooked. Notice the twists along the edge a la Mom. Then you drop them in a pot of boiling water.